In most traditional software development methods, a dedicated team of quality assurance (QA) individuals test and check for issues in new software products, but when these individuals test the product depends on the type of development methodology you use. As companies around the world begin to go agile, learn more about agile testing and see whether you should join the ranks. Agile development is focused on delivering working, iterative software as quickly and as frequently as possible. Agile testing is the process of testing software for issues or bugs during an agile workflow. Unlike the waterfall approach, where QA team members would not get involved until the end of software production, agile testing does not wait to repair or mitigate errors; work is completed as soon as the issues are discovered, leading to faster development and product delivery. But how is agile testing folded into agile software development? Instead of waiting to contribute to the project once it’s in the final stages, an agile tester must reframe their thinking and their actions. They are no longer “just a tester” but a contributing member of the team, working to improve upon the product throughout the process. The agile project management methodology streamlines processes to develop a shippable product in less time. Agile testing is no different: it jump-starts the testing process and uncovers issues sooner rather than later. In a waterfall testing environment, bugs are recorded and fixed at the end of a project, and the methodology places a big emphasis on documentation. Often, a QA team doesn’t even begin to test until a thorough testing plan has been scoped and written. In contrast, agile testing includes testers in all relevant project meetings and syncs from the very beginning. Agile testing is not a phase but a continuous action that happens throughout the agile development process, so the team needs to adjust accordingly. Since the agile method doesn’t allow time for mass documentation, product requirements or features are often communicated verbally. Agile testing requires open communication across all departments since change happens rapidly and frequently. Fast and effective documentation provides the backup you need to push your projects through the agile testing process. If you have a process for the QA team to log issues, you can visualize that process in Lucidchart so everyone is on the same page as far as what to do when they discover bugs. A QA team is made of various testers who review the product or service from start to finish, exploring every possible user journey and looking for interruptions or abnormalities in the process. With agile development, dedicated QA time at the end of production is not an option. Therefore, every member must be in a testing mindset throughout the project. Team members must leverage their unique skill sets to become specialized testers. For example, a programmer is more adept at spotting coding issues than a designer is. Similarly, a designer is likely to recognize issues with the functionality and design of a product before a programmer does. Relying on the individual strengths of team members is what agile is all about. Each contributor should make notations as they discover issues in their areas of expertise instead of waiting until the project is completed. See how our QA team at Lucid uses mind maps as they mob test new features. A lot of the work a QA tester does can be automated with predetermined actions. The more testing that can be automated, the more free time a tester has to tackle other issues. Because agile testing is a continuous process, automating where possible saves time and effort, and it frees up bandwidth as well. Relying on testing tools to perform predetermined tasks reduces the chance of missing a testing phase. And while automation may require up-front software costs, you can see the return on investment immediately in the form of additional technical capital and manpower. If development teams were given all the time in the world, a product would include all the latest and most impressive features right out of the gate. But tech companies today don’t have the luxury of time—they have to move fast and innovate or risk becoming obsolete. With the agile method, teams arrive at a working product as fast as possible. Therefore, you should prioritize essential features over more complex features to form your minimum viable product (MVP). 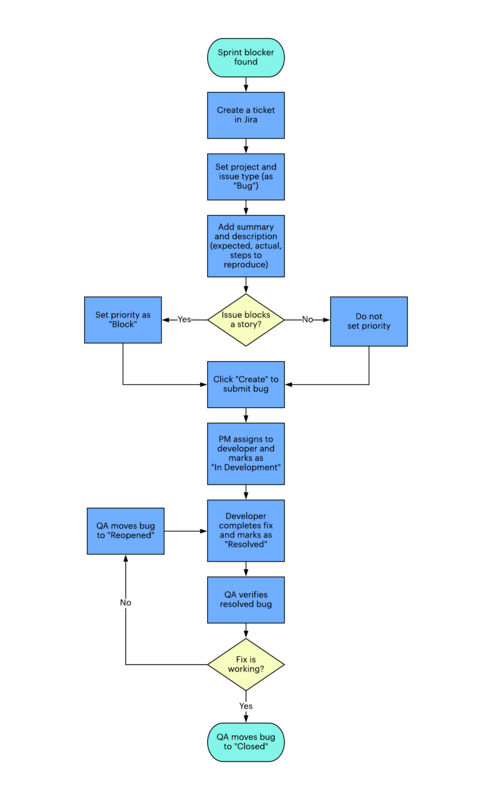 Use a Lucidchart flowchart to help your team determine the priority of issues and features. The same concept applies to fixing issues. Implement a cost-benefit analysis to weigh the risk vs. reward of including features or fixing issues. If a product can fulfill its intended purpose without rewriting a section of code, take the path of least resistance. Don’t spend valuable technical capital trying to perfect every aspect of the product. You can reevaluate product features in later sprints. The point of an agile method of production is its iterative approach. Use findings from one sprint to inform or improve upon the next one. When testing happens continuously throughout a process, there is better transfer from one sprint to the next. Issues remain top of mind and are solved sooner in the sprint. Through the agile testing methodology, developers identify the most important features and functions of a product. Agile testing is an example of how productive agile development can be. The ownership of an agile project is in the hands of the development team, and team members are testing as a group and individually to maximize their efforts. Agile promotes streamlining processes, which prompts teams to look for ways to automate wherever possible. Because testing takes place alongside development, you shorten the feedback loop, saving time and resources. Testers can ask questions of developers in real time to address issues. Basically, testers need to adapt the way they operate to include more conversations, get involved in a project up front, and automate as much as possible. Change is inevitable, so stop fighting it. The sooner your QA team embraces an agile mindset, the faster software can be created and released. Use the complete suite of Lucidchart diagrams and templates to develop your own unique agile testing process.